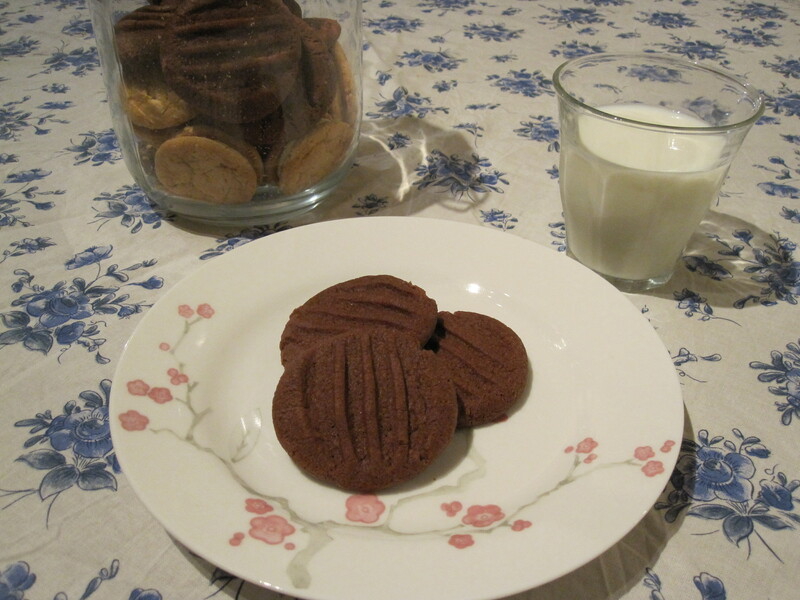 These biscuits are easy and so so delicious! Really, you need no other reccomendation to cook them. Do it now! For so simple an ingredient list they are absolutley delightful. They remind me or a biscuit we used to get at school at break time. 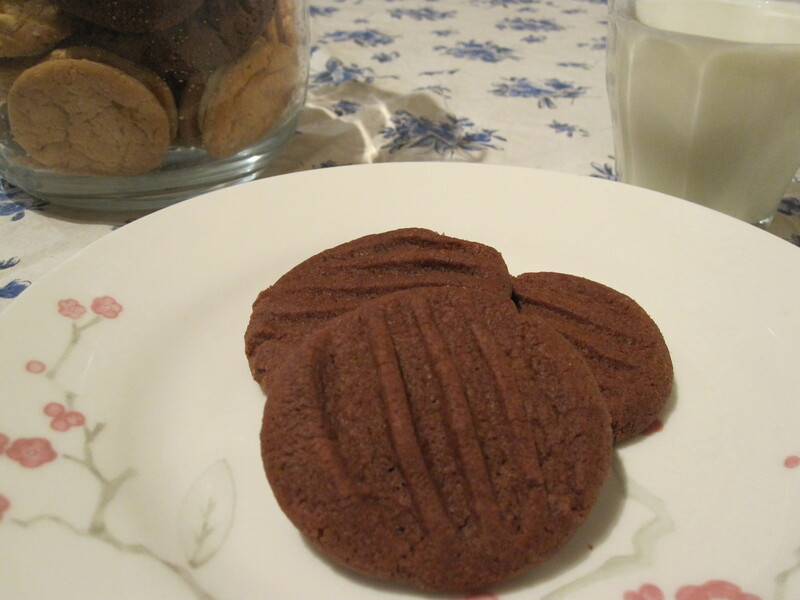 Perfect with a glass of milk, I dare you to just eat one! These come from Nigella’s HTBADG and I’ve yet to find a recipe in there that doesn’t work and that I don’t like. It really is as fabulous a book as everyone says. I was browsing the pages while I waited for one of my cakes to cook/cool etc. and I just so happened to have half a packet of butter left so I whipped up half a batch of these. I suppose I should be glad I didn’t make a whole batch because I’d have eaten them all myself but I’m a little sad I didn’t, fat be damned! – Heat the oven to gas mark 3, grease/line 2 baking sheets. – Cream together the butter and the sugar until smooth and fluffy. – Seive in the flour and cocoa. – Pinch off walnut sized chunks and roll into balls. – Place on a baking tray, well spaced as they will spread. – Press down with a fork to give them the lines. – Bake for 5 minutes then turn down to gas mark 2 and bake for a further 10-15 minutes. Bake until just firm. The biscuit should not be soft to the touch but if it’s rock hard you’ve gone too far! – Place on a wire rack to cool. – You will need to cook these in two batches unless you have a stupidly large oven so turn the oven back up and start again. Ok, I confess, I totally didn’t get a photo of my “actual” birthday cake. Mum is the custodian of those photos. I was too busy scoffing it to take photos! (For reference it was a lovely sachertorte with raspberry jam and fresh raspberres on top.) Also, my birthday was last Tuesday so I’m woefully behind on posting! 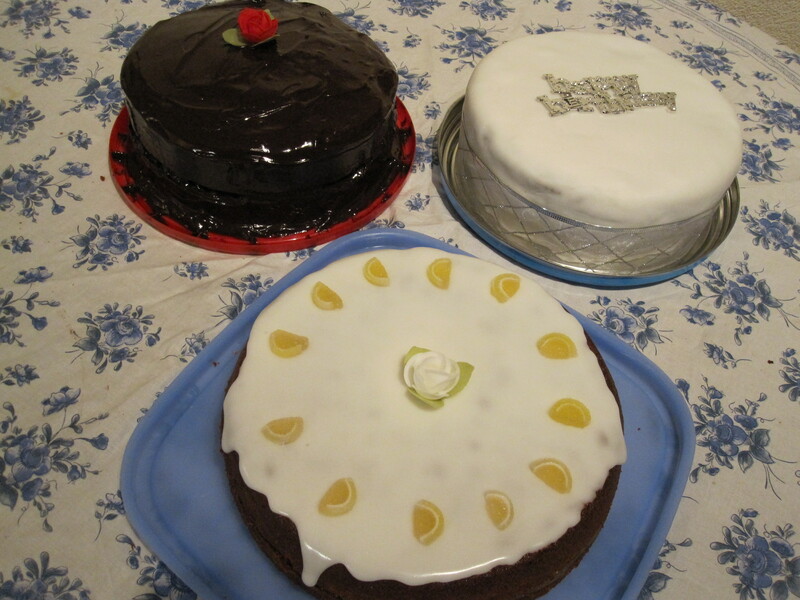 However, I did whip up these three cakes to take into the office. The feed back was mostly positive. “Life changing!” “To die for!” “Amazing!” “Out of this world!” and “How much brandy did you put in this fuitcake?” were the main comments. For reference there wasn’t actually very much brandy in the fruitcake, I just used the good stuff! Ok, so I may have given it a liberal drizzle once it cooked as well but what’s a fruit cak e withough booze! The ready roll icing totally let me down though, cracked as I unrolled it, stretched out when I lifted it and generally refused to behave at all. Very disappointing. 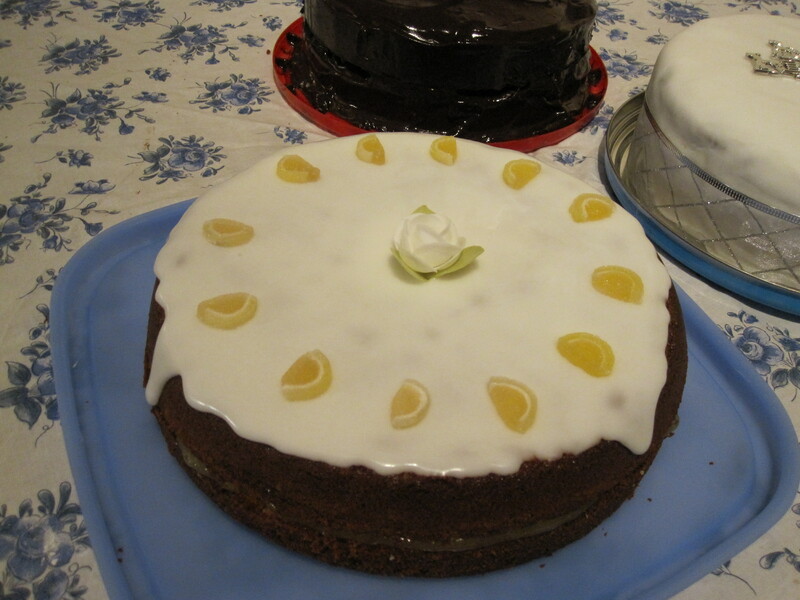 The Lemon and almond cake was the Easy Almond Cake in yet another incarnation. Filled with lemon curd and then simply topped with a lemon glace icing. It really is ridiculously easy and so flamin’ delicious! It took much longer to cook this time for some reason, 55 mins in total and it might have done with a bit longer but I did not have any longer so I declared it to be cooked! It was perfectly fine, though had sunk a tiny bit in the middle. The chocolate cake was something of an invention. 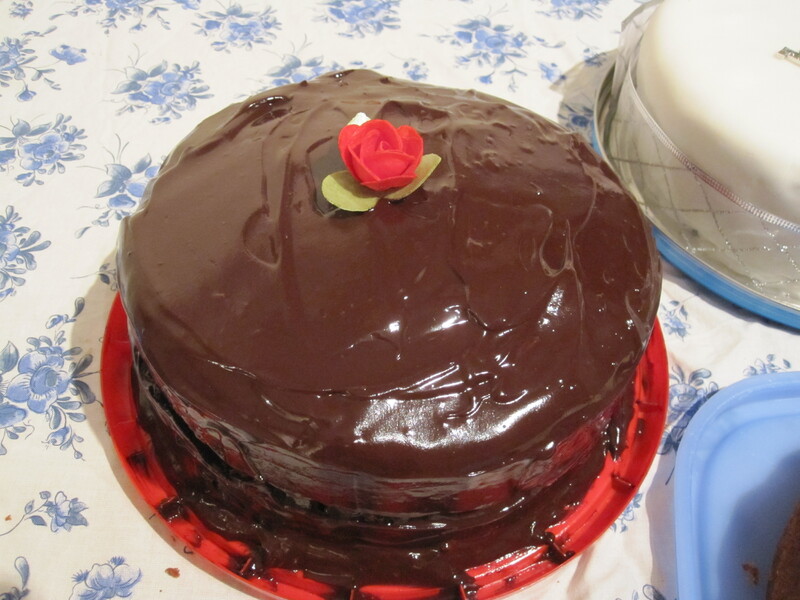 It was a simple sponge cake with cocoa, iced with ganache and filled with raspberry jam. I dropped it. Luckily the ganache hadn’t set so it was hastily patched back together! Here’s the basic recipe, but I was winging it rather! – Heat the oven to gas mark 4 and grease 2 8″ sandwich tins. – In a food processor cream together the butter and the sugar. – Add the eggs one at a time down the funnel with the motor running. – Add the vanilla extract and give a quick blitz to mix. – Add the flour and cocoa powder and blitz until totally mixed. – Add the milk and blend until all incorporated and the batter is smooth and runny. If you need a little more milk to make it runny go ahead. – Bake for 25-30 mins until set in the middle and a skewer inserted comes out clean. – Remove from the tins to a wire rack to cool. – Ice as you wish. – Break the chocolate into pieces in a pyrex bowl. – Place the bowl over a small saucepan of boiling water and heat until melted. – Add the cream and beat until thick, smooth and glossy. – Allow to cool so it’s no longer hot but still mobile and glossy. – Ice the cake… this will be messy… best to just shower after, yeah?